School of Engineering organized an interaction program on March 25, 2013 with school headmaster and teachers. Main purpose of the interaction is for linking university education to rural community for use of Information Technology and Engineering services for development and prosperous life. There were 80 participants representing different high schools of Kavre. One group each from CE/CS and EE second year students shared their experience gained during community education project tour. Asst Prof. Brijesh Adhikary (Act HoD, DoEEE and Project Manager, CEPP) presented on Community Education Pilot Project (CEPP). 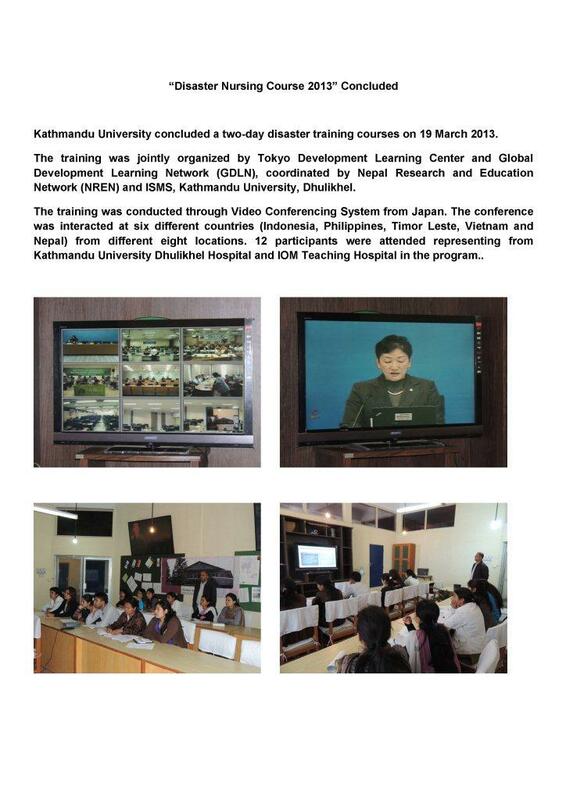 Asst Prof. Subodh Ghimire (DoEEE) presented on SASEC RTN. Guest presenters were Mr. Narayan Prasad Bhatta (District Education Officer) and Mr. Madhu Acharya (Third Eye, NGO). Finally concluding remarks was given by Prof.Dr Bhola Thapa, Dean, SOE in which he highlighted on the importance of education in community and contribution done by Kathmandu University in community sector. Mr. Sushil Shrestha (DoCSE and CEPP member) expressed vote of thanks to all the participants on behalf of Kathmandu University and CEPP for their participation in the interaction program. The objective of the program was to understand the need of rural community for the use of Information Technology and Engineering Services for development and prosperous life. Dr. Bal Chandra Luitel, Associate Professor of Mathematics Education, presented a paper on Radicalizando a Educação Matemática através da Matemática do Planeta Terra (Radicalizing mathematics education through the perspective of the Mathematics of Planet Earth) at the 2013 annual meeting of Associação de Professores de Matemática (Association of Mathematics Teachers in Portugal) at the city of Alfubeira, Portugal. Seven students, one from each School of Kathmandu University, and three from different institutions under Tribhuvan University are on an academic institutions visit to Pakistan from 23 March to 1st April. 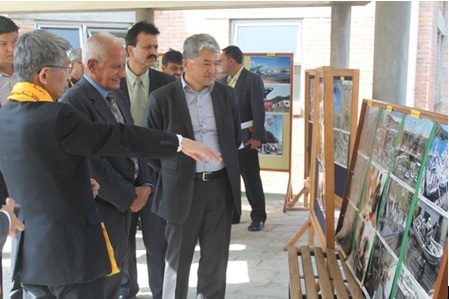 This visit, sponsored by the Ministry of Foreign Affairs and the Ministry of Education , Pakistan is led by Director of Student Welfare, Kathmandu University, Higher Education Commission of Pakistan is the organizer and with this visit it is hoped that the Nepali students will get to know about the education system and programmes that the universities in Pakistan are offering. Students will also have interaction with the students and faculty at universities in Lahore and Islamabad . E&T Japan Co. Ltd., a leading software company having its units in Nepal, Thailand and Japan provided research grant amounts to NRs. 5,00,000.00 to Department of Mechanical Engineering, Kathmandu University on March 18, 2013. The official contract paper that was signed between the company and the University was presented by the president of E&T Japan Co. Ltd., Mr. Sakae Nagata to the Head of Department of Mechanical Engineering, Associate Professor Dr. Bim Prasad Shrestha at the meeting hall of the department. A part of research grant is provided to final year undergraduate lady mechanical engineering student of the department Ms. Rojina Bade who has been able to secure the highest CGPA among lady student till now. Kathmandu University-Lecture Series XXIX Interaction with Ananta Ram Baidya, P.E. Interaction with Ananta Ram Baidya, P.E. Centre for Excellence in Production and Transpiration of Electrical Energy (CEPTE) has been organizing the Kathmandu University-Lecture Series (KULS) at Kathmandu University with the aim to give practical information on current issues of R&D, policy for sustainable management of infrastructure development and their implementation to students, faculties and invitees. Prominent experts in the field are invited to share their knowledge with KULS participants. The chief guest of this 29th round of KULS interaction is Ananta Ram Baidya, P.E. Ananta Ram Baidya is a registered Civil Engineer in California and an East-West Center Graduate. He has been practicing Structural Engineering in the United States for well over the last 30 years. His educational portfolio includes a B.Tech. (Hons.) in Civil Engineering from IIT, Kharagpur and M.S. (Civil) from the University of Hawaii. He served in Institute of Engineering, Pulchowk, as a lecturer before leaving for the United States of America. His work has been in both the private and government sectors in the United States. He recently retired from the City of San Diego, California, as an Engineer reviewing and commenting on projects prepared by other licensed architects and engineers for compliance with different rules and regulations that deal with earthquake safety, safety in case of fires in various types of buildings, access compliance for the disabled and other regulatory process that involved land and project developments. His experience also focuses on the restoration and upgrade of old and historical buildings to meet both earthquake safety, fire-life safety and disabled access requirements. *Starting 3:00 sharp. Please be on time. National Water Week was celebrated today ( March 21st ) in Kathmandu University School of Arts, Hattiban Complex. The programme was organized by the students of Bachelor in Community Development along with a few organizations from outside. The main topic in the programme was "Stone Spouts in Kathmandu - History, Culture and Development ". Faculty of the School also participated. Turbine Testing Lab has organized an International Symposium on "Current Research in Hydraulic Turbines, CRHT-II" on the occasion of its first anniversary. This symposium was the continuation of the first Symposium organized on 23 March 2010. The scope of Symposium was focused at PhD and Masters Students thesis works related to Hydro turbines. However, R&D activities related to hydro power in general have also been covered. The main objective of this symposium was to bring young researchers working in hydropower sector to a common platform to share their research experiences and also develop networking for future endeavors. A one day international Symposium on “Current Research in Hydraulic Turbines, CRHT-II” organized by Turbine Testing Lab, Department of Mechanical Engineering on 19th March 2013, on the occasion of its first anniversary, was accomplished efficaciously with huge applaud from all the participants and presenters. The program started at 9:30 am with the welcome speech by Prof. Dr. Bhola Thapa, Dean of School of Engineering, Kathmandu University. Prof. Thapa talked about challenges faced during the planning and construction period of the lab and also assured to implement the outputs of research into business in coming years. He welcomed all the participants and presenters from different universities with deep gratitude. The welcome speech was followed by program overview by Mr. Biraj Singh Thapa, Symposium coordinator, Assistant Professor and Faculty-In-Charge, TTL. He highlighted the facts and features of Turbine Testing Lab, Kathmandu University. He also talked about the ongoing research projects at Lab and the recent accomplishments made, in his presentation. The symposium was inaugurated by Dr. Ram Kantha Makaju Shrestha, Vice-Chancellor, Kathmandu University. In his inaugural speech, he shared his amusing experience in his field and inspired every participants and presenters present in the auditorium. He urged the young researchers to take the problems as challenges and convert them into opportunities. He also assured that as the team leader the university he will not leave a sing stone unturned to achieve the goals and objective of KU. He also extended his warm wishes and greetings and wished for the success of the symposium. After the brief inauguration session, the first round of presentation session was instigated. The presentation session was attention-grabbing and remarkable with diverse group of presenters present in the symposium. A total of 25 presentations were made of which 13 presentations were made by the students from Norwegian Institute of Science and Technology, 10 presentations were made by students from Kathmandu University, 1 presentation was by Master level student, Royal Institute of Technology, Sweden and 1 presentation was by researcher at PEEDA. The first session of presentation was chaired by Dr. Hari Prasad Neopane, Associate Professor, Kathmandu University. He is an expert in Hydraulic Turbine Design and sediment erosion. Presenter Peter Joachim Gogstad started the session with his presentation on the topic “Pressure Pulsations in Francis Turbine”, PhD candidate, NTNU. At the end of the session I the Chairman summarized all the presentations. And a brief question and answer session was followed, in which the audience came up with very interesting questions and made the information sharing more effective. Session II was chaired by Mr. Brijesh Adhikary, Acting HOD of Electrical Engineering Department, Kathmandu University who is also the project leader in a mini grid design project and project coordinator in Community Education Pilot Project. This session started with the presentation of PhD Candidate at KU, Mr. Laxman Poudel on the topic “Study on sediment characterization & its impact on hydraulic Turbine Material”. The third and last session was chaired by Dr. Bibek Baral, Associate Professor, Kathmandu University. His area of research is renewable energy particularly in Bio- Energy. And this session started with another PhD candidate at KU, Mr. Krishna Prasad Shrestha on the topic “Design of Francis Turbine Runner against Sediment Erosion”. The last presenter of the day was Oystein Sveinsgjerd Hveem and he discussed about different governing systems used in the hydro power operation. At the end of the session III, Chairperson Dr. Bibek Baral summarized the session and coordinated the question answer session. A short closing program was organized after the completion of session III. Head of the Department of Mechanical Engineering delivered his closing remarks with his expectations that the objectives were achieved and message from this symposium will be taken back to home country by international participants. Dr. Hari Neopane summarized the major issues discussed during the symposium on behalf of session chairmen. He also thanked all the participants for delivering good presentations in limited time. The one day International symposium ended with a sense of enthusiasm and inquisitiveness among all the presenters and participants. The symposium guaranteed the extension of knowledge and was formally closed by Registrar, Prof. Bhadraman Tuladhar, KU with hope to reduce energy crises in the future. After the completion of the seminar, the students from NTNU and major participants were taken for a short tour of university departments and laboratories. A Four-day long ArtEngineering Workshop concluded in Kathmandu University on 15 March 2013. Department of Mechanical Engineering, School of Engineering in association with the Centre for Art and Design of School of Arts of Kathmandu University organized this workshop with the main objective to develop analytical: creativeness and collaborative design concept on ART and Engineering student of KU with utilization of Metal Junks. Registrar Prof. Dr. Bhadraman Tuladhar inaugurated the workshop. He motivated the workshop by comparing the use of junk Pelton turbine from Khimti as a piece of art in the university premises. He also encouraged the participants to create a meaningful product using both the genre of art and engineering. He further encouraged for continuation of ArtEngineering in years to come. Prof. Dr. Bhola Thapa, Dean School Of Engineering welcomed the guests and the participants and expressed pride in being able to conduct the second edition of the workshop following a successful organization of “SAMYOJAN the new dimension - Workshop on Metal Casting by Lost Wax Method” a year before. He expressed the outcome of first edition as being successful in manufacturing a 2 KW Francis Turbine, a first of its working kind in Nepal using the Lost wax Technique. He further recommended for conducting other editions of the ArtEngineering by electrical, computer and music departments. Associate Prof. Dr. Bim P. Shrestha discussed about the synergic combination of students from arts and engineering in designing a product. He talked about the life that Art can provide in product design; and motivated the participants for the good time at workshop. Similarly, Mr. Biraj Singh Thapa, Faculty in charge, Turbine Testing Lab expressed his pleasure in conducting this workshop and disclosed about the previous edition using Lost Wax Metal Casting being successful in casting a Francis Turbine. In the same manner Mr. Tejesh Man Shakya, express his thought on art being only limited to dreams without engineering. He presented the use of junk metal as an art. In total 32 students, 13 from Art and 19 from engineering participated in the workshop, were kept under the close supervision of program coordinator Krishna P. Shrestha, Instructor BhuvanThapa and Tejesh Man Shakya. The participants got an exposure to Metal Joining processes. In addition to it, painting was also done to give the product esthetic value without losing art philosophy. The products prepared by the participants were demonstrated to the Chairperson Vice-Chancellor Dr. Ram Kantha Makaju, Prof. Dr. BholaThapa, Dean, School of Engineering and Associate Prof. Dr. Bim P. Shrestha. In the closing ceremony, Dr. Thapa expressed his delight in the products prepared in the limited time frame. He also motivated for the further edition of ArtEngineering not to be limited to Art and Mechanical department and the location of the workshop to be expanded further from university premises. Similarly, Dr. Bim P. Shrestha appreciated the participants for their works and suggested the participants to create nameplate to preserve their own art work. During the end session, the certificates were distributed to all the participants and technical team. A documentary show was held at CV Raman auditorium in Kathmandu University on March 11, Monday to commemorate the great Tohoku Earthquake and Tsunami that occurred near the northeast coast of Japan on 11 March 2011. 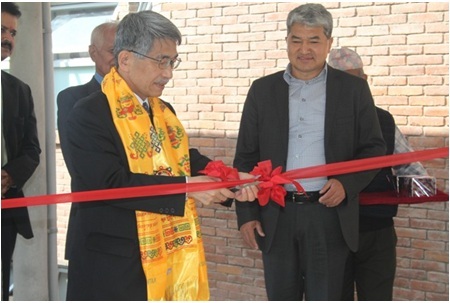 The program was started by His Excellency the ambassador of Japan to Nepal Mr. Kunio Takahashi by inaugurating the photo exhibition of the Tohuku earthquake, its immediate aftermath and the recovery effort carried out by Japanese and other oversees volunteers in last two years. The documentary show was attended by Excellency Mr. Kunio Takahashi, The Ambassador of Japan to Nepal, Vice Chancellor Prof. Dr. Ram Kantha Makaju Shrestha, Founder Vice Chancellor Prof. Dr. Suresh Raj Sharma, Registrar Prof. Dr. Bhadra Man Tuladhar, Dean of School of Science Prof. Dr. Panna Thapa, Dean at School of Engineering Prof. Dr. Bhola Thapa, Chief Administrative officer Mr. Mukunda Prasad Updhyaya, the first Secretary of the embassy of Japan in Nepal Mr. Kiyohiko Hamada and Heads different department at KU and invited guest Dr. Tshiring Lama, Country Director of Child Reach Nepal. More than 250 people attended the program that included students and staff of Kathmandu University. The program started with welcome note by Mr. Parash Khadka graduate student at Department of Mechanical Engineering and a minute of silence conducted by Dr. Bim Prasad Shrestha to pay tribute to those who lost their lives exactly two years ago. The documentary show was one of the motivating that carried a story of a fisherman; how he could succeed to recover his business within 3 months of the disaster. Art and Engineering technology can play a leading role to provide innovating esthetic, commercial and engineering value for these junk metals. ArtEngineering II workshop will play an innovative role for making objects from junk metals through the intersection of ideas from art and engineering students. This workshop will expect to create the new horizon for the junk metals management and its effective use. Kathmandu University, Department of Mechanical Engineering in association with Centre for Arts and Design is organizing a 4 days’ workshop titled as “Workshop on ArtEngineering-II - Utilization OF Metal Junks”. The main aim of this workshop is to educate the fusion of Metal Joining Processes applied in ART as well as in Engineering re-using the metal junk. The workshop will be conducted at Mechanical Workshop, Kathmandu University, Dhulikhel from 12-15 March 2013. Workshop on ArtEngineering-II is targeted to the students and researchers from Kathmandu University School of Engineering and Centre for Art and Design. This workshop is planned for 25 participants. Workshop will accommodate 13 students from Centre for art and Design and 12 students from Department of Mechanical Engineering. Hereby, Department of Mechanical Engineering calls application from the interested participants. The application form and brochure can be downloaded from www.ku.edu.np/ttl or can be obtained from TTL office. The application has to be submitted to TTL office or by email to ttl@ku.edu.np no later than 10 March 2013. In case of higher number of applicants the selection will be done by the organizing committee based on the background and motivation of applicants. The list of selected participants will be published on 11 March 2013. A subsidized registration fee of NRS 500 (Five Hundred only) should be paid by all the participants to attend the workshop.